Though I haven’t seen all of Robert Altman’s movies—about half, I’d say—I consider myself a fan. (Bold statement, right?) While going through a phase five or six years ago—inspired by seeing Short Cuts for the first time—I purchased Nashville on DVD, fully intending to watch it right away. But I never did, partly because I think I was saving the experience, waiting to savor it, assuming it would be a pretty momentous one, considering the movie’s reputation among cinephiles. It’s in the National Film Registry. It’s on the AFI’s top-100 list. The major critics generally agree that it sits right up there with the great movies of all time. (The competition in 1975, when it was released, was particulary stiff: Jaws, One Flew Over The Cuckoo’s Nest, Dog Day Afternoon, The Apple Dumpling Gang, Barry Lyndon.) So it’s no surprise that the answer to this column’s titular question is an easy one: Of course. But that doesn’t mean Nashville is an easy movie to love, and certainly not on first viewing. It expects a lot, since it throws away most of the rules about structure and story arcs in search of a bolder, richer vision. In an interview in the DVD’s special features, Altman describes the movie as a panorama, which is the perfect word, because it evokes something beautiful, but viewed deliberately at a distance. How close can you get to one particular character when there are two dozen “main characters” in Nashville? 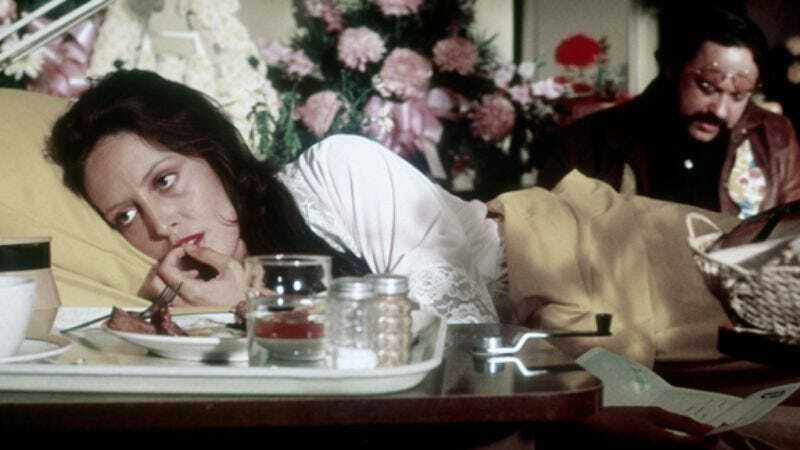 Altman doesn’t offer anyone up as the protagonist, and often, he draws just enough of a sketch so you don’t forget a character, then moves on. And that’s maybe the core of Nashville’s brilliance—its almost casual reliance on quick impressions. It doesn’t take more than a minute to convey that Henry Gibson is a smug sumbitch who thinks he’s the center of the city’s music scene, or to realize that Ronee Blakley is a mess. But these aren’t one-dimensional portraits by any means: Each person is followed throughout the city and allowed to interact in a web that quickly, assuredly paints a picture of who he or she is. By giving us so many “main” characters, Nashville sets itself free of having to resolve any one story. These people aren’t going to change, and they probably won’t be learning any lessons. (Or, God forbid, trying to teach us any.) In his excellent essay on the movie, Roger Ebert describes a scene between Lily Tomlin and Keith Carradine as a short story, and he’s right—but really, the entire movie feels like a collection of those short stories, with recurring characters tied together because they all happen to be in Music City, U.S.A.
And yes, there’s a ton of music in Nashville, much of it written by the stars who performed it. About 60 of the movie’s 160 minutes is straight-up performance, some of it very good, some of it deliberately bad, all delivered in an attempt to show the spectrum of success and failure in a town that country musicians treat like rockers treat L.A.: They get off the bus with just a guitar and a dream, and only a few have the right combination of talent and luck. So there’s Carradine, a lonely womanizer who’s trying to break away from his successful folk-rock trio; Blakley, who sits atop the country world, but is constantly on the brink of breakdown; Karen Black, who’s semi-successful, but not terribly talented; and Gwen Welles, who can’t sing a note, but has enough ambition to keep her blind. They all get turns at the mic, and though it seems like that should slow the movie down, it’s all part of the deliberate pacing that gives Nashville its panoramic feel. Where there are musicians, there are hangers-on, naturally. Geraldine Chaplin is hilariously over the top as a BBC reporter who worms her way into the lives of the rich and famous—she has a great scene that requires her to ignore a singing Dave Peel when Elliott Gould (playing himself) enters a scene. Shelley Duvall is a wisp of energy who changes her clothes and her lover in pretty much every scene. Scott Glenn and David Hayward wander the background of several scenes, menacing and strange. They’re stalkers before that phenomenon really had a name. They all come together at Nashville’s Parthenon for a political rally/jamboree for an unseen but frequently heard presidential candidate named Hal Phillip Walker. Walker’s speeches—often delivered from a campaign van—frame much of Nashville. His platform is anti-lawyer, pro-common sense, and awfully prescient of Ross Perot’s 1992 run. (Or Ralph Nader, or Jesse Ventura—think “no-nonsense outsider.”) The political stuff is weirdly clumsy and almost extraneous, but in a charming, mostly effective way. More than anything, it gives Ned Beatty something to do—he helps organize the concert—and it brings the cast together in one place for a bit of a shocking ending. (Spoiler alert!) For no reason whatsoever—and that’s really the point—Hayward shoots Blakley while she’s onstage singing. This gives aspiring singer Barbara Harris her big chance at fame, and she grabs it, ending the movie on an unusually sweet note. The show must go on. Altman claims that The Washington Post called him immediately after John Lennon’s murder, asking him if he felt Nashville was partly to blame. He turned the tables, asking them why they didn’t heed the movie’s warning. To be fair, that warning isn’t exactly explicit: Nashville doesn’t pretend to offer any answers. It’s just a big, sprawling look at how one town’s peculiar industry touches a whole bunch of lives. Its ability to be so emotionally resonant while only offering glimpses of lives is a testament to the power of its director (and most certainly his editing team as well). It’s definitely better late than never, and better than that, it’ll surely get better over the years, too.